ASK ABOUT OUR MINI-PALOOZA SHOW!! Minikiss is a high energy rock show made of little people that illuminate Kiss. We play Kiss and other 80’s rock hits. We dress in full gear and make up. Minikiss performs for all venues. We specialize in Casinos, Theme Parks, Corporate Parties, Grand Openings, bar’s, pubs, fund raisers, all indoor and outdoor events. In 2010 MINIKISS was in the Dr. Pepper / Kiss Super Bowl Sunday Commercial. It was a hit!! The commercial aired all year. Also in 2010, Minikiss hit the road for it’s 1st ever US tour. Minikiss toured from State to State, City to City with much success!! Minikiss has toured with A PERFECT CIRCLE, JACKYL, BLUE OYSTER CULT, AIR SUPPLY, PETER FRAMPTON and many others. 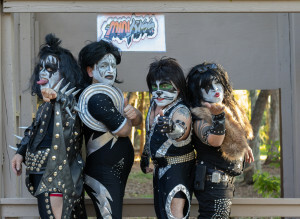 If you like entertainment and rock & roll, than you will love MINIKISS!! This is must see show for all venues of all ages. Please keep in mind that we at MINIKISS do rotate band members, but alway’s offer you the highest quality in entertainment. Here is a video with MINIKISS performing for Canoble Lake Park October screamfest 2 years in a row.